The movie, The King’s Speech, drew attention to the enormous challenges of public speaking by someone with a disability. Hopefully, you are not afflicted with a speech disorder but non-the-less, public speaking can still be a challenge for many people. This book will try to help you communicate effectively with your audience. First, it will provide you with hints on making a formal speech from a podium. It will talk about many techniques which will greatly enhance your delivery and help to make your audience feel involved. Secondly, it leads you through some specific scenarios: the after dinner speech, delivering an address at a wedding and the delicate task of delivering a compassionate eulogy at a funeral. You’ll learn how to handle each of these situations with flair and sensitivity. Thirdly, it will show you how to make effective presentations at business meetings, instructional seminars and workshops. It provides you with a review of several software programs which will help you create great slides to reinforce what you have to say. Next, the book takes you behind the scenes in television and radio studios. You’ll also get some hints to help you speak "publically" over the Internet. Practice and preparation are of vital importance before you attempt to speak in public and are given some hints on how to make your public speaking performance an outstanding success. This book is all about effective communication: how to impart your message to your audience; whether it be directly, face-to-face or indirectly over the airwaves or over the Internet. If you want to be an effective and dynamic speaker, you should read this book before you do anything else. Chapter 10: Prepare! Prepare! Prepare! Practice! Practice! Practice! 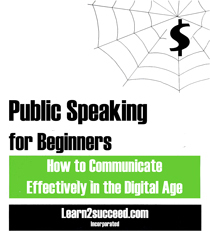 Public Speaking for Beginners: How to Communicate Effectively in the Digital Age by: Learn2succeed.com Incorporated: Softcover; 78 pages;ISBN: 978-1-55270-452-3 published in 2012; $15.99.